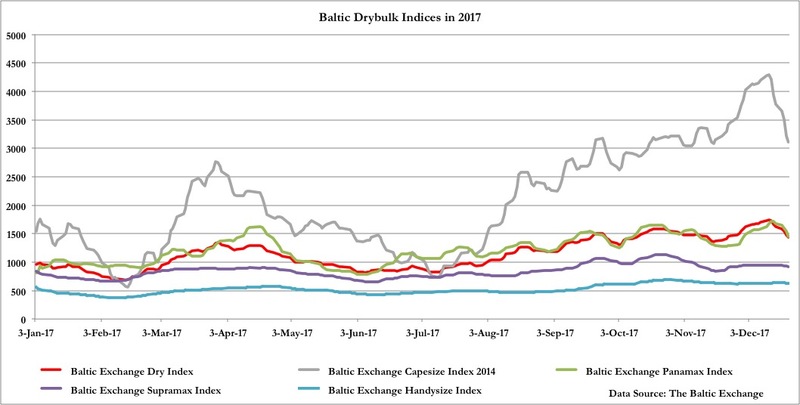 Posted on December 29, 2017 by Karatzas Marine Advisors & Co.
2017 was a fairly good year for the drybulk market. As compared to 2016, truth being told, 2017 was an exceptional year. All segments of the drybulk market have moved from severely depressed levels (with a meaningful part of the world fleet idle then) to profitable levels; at some point in early 2016, it seems that all types of drybulk vessels, irrespective of size and segment, were earning $4,000 per diem, if they managed to find employment at all. 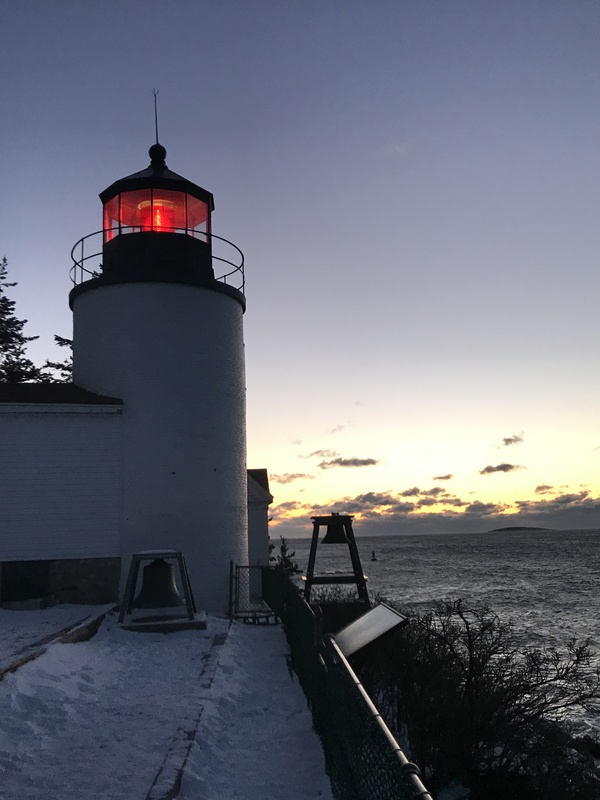 By comparison, in November 2017, capesize vessels most noticeably were etching earnings close to $30,000 pd. And, looking forward, the prospects for 2018 seem at least fair for the drybulk market, while tankers and containerships hold hope. Shipping is far from showing a full recovery from the crisis, but at present the market seems optimistic, especially when one considers the abysmal days of the market bottom in March 2016. 2017 has been a fairly decent market for the sale and purchase (S&P) of shipping assets. Vessels were bought and sold, but mainly they were bought, at a livelier pace than in 2015 or 2016; overall, S&P activity has been higher by 34% in 2017 for the drybulk market than the previous two years, a welcome development for S&P brokers. And, most of the vessels were bought in expectations of a recovering market instead of getting sold as in the past in a bloodbath of a market at auctions and other forced sale scenarios. With increasing volume for S&P in an improving freight market, one would be forgiven to assume that shipping assets prices were on a roll in 2017. It’s true that vessels’ values for dry bulk have improved, driven by an improving freight market and good prospects for the immediate and near future; however, asset pricing was nowhere close to match the freight market’s buoyancy. Freight rates increased by a multifold factor, while asset prices dragged along. 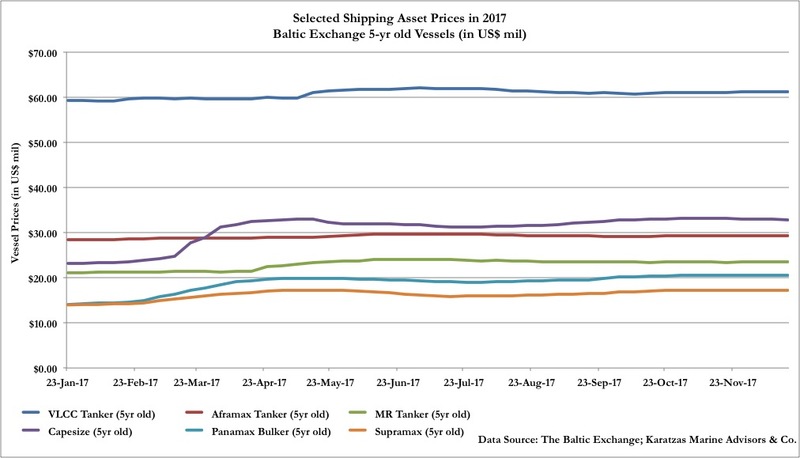 As per the attached graph, prices of asset classes tracked by the Baltic Exchange under their Baltic Exchange S&P Assessment Index (BSPA) for five-year old vessels, both tankers and bulkers, have been steady. 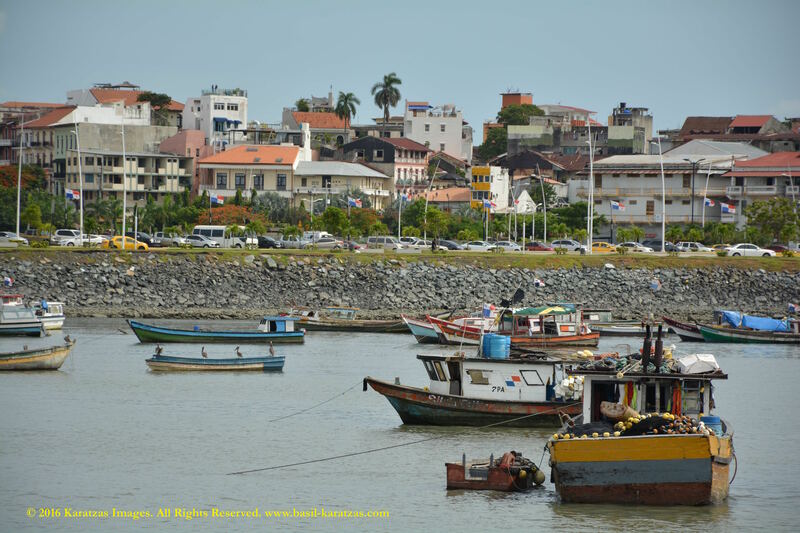 [Karatzas Marine Advisors is an active member of The Baltic Exchange]. For tankers, prices have shown in 2017 as much liveliness as if trading in a sea of tranquility – exhibiting almost prefect flat lines. For bulkers, there has been a relatively mild improvement in the spring of 2017, but flat lines that resemble tanker prices followed. Still, year-over-year, there is a 25% increase for capesize vessels and milder improvements for other types of dry bulk vessels. Again, these are data for five-year old vessels, and older vessels performed better and newer vessels performed a bit worse than five-year old vessels; and again, these are asset price increases in 2017 alone, not from the bottom of the market in 2016 – where price improvements have been more significant. But again, and without wishing to burst anyone’s bubble, the Standard & Poor’s (S&P 500) index in the USA achieved almost a 20% performance in 2017, and this with all the benefits of a liquid investment. Asset prices in 2017 have been un-inspiring for all types of vessels, including drybulk, tankers and containerships. We have written in a different post about the sale & purchase market and asset playing as a business idea that seems that it lost its luster. Hopefully there are much better days in shipping and we are in the early stages of a lengthy and strong recovery; and, likely those who bought ships in 2017 and 2016 will get to enjoy much stronger markets and asset prices. Our skepticism on the subdued state of the sale & purchase market and its impact on the asset play theme is that they may be early signs that the shipping industry is facing structural changes while we all celebrate the strength of the freight market recovery. It would appear that with the lack of plentiful and cheap debt financing, flipping shipping assets is not as appealing any more. More of one’s money has to be committed to the “bet”, which is makes it costlier to buy ships and play and game. And, more importantly, lack of availability of cheap money for other buyers makes it harder for other people (and potential buyers) of one’s assets to get optimistic and bid up asset prices and pay you a strong price to buy your assets. Or, it may be that shipping is finding its calling that it is actually for transporting goods and being part of the logistics chain and not a speculative instrument for buying and selling ships and stretching one’s fleet like an accordion and being highly opportunistic with the market and business relations. Even more concerning that the lack of shipping finance prospect affecting asset prices is that the freight market recovery may not considered to be real and sustainable by the “smart money”. Even shipowners with access to cash, few reference names have made substantial purchases in 2017, a few individual acquisitions notwithstanding. Shipowners who in previous down-cycles were loading up on cheap tonnage, it seems this time around have gone on a buyer’s strike. It’s interesting seeing who’s doing the buying and who is doing the preaching, and who’s buying with their own money and who is buying with other people’s money. As another of Yogi Berra’s pith quotations has it, “you can observe a lot by just watching”. And who has been doing the buying in the S&P market in 2017 is not strongly convincing. There have been reports elsewhere that Greeks and Americans have been the highest buyers of ships in 2017, and the geography of these two countries may indicate trends in the market, at least in the short term and at least for 2017. Access to shipping expertise and access to capital have always been two competitive advantages to have in shipping. Hopefully the trend will continue as our firm has intimate access to both of these markets. We only hope that 2018 will be a better and more active year for S&P that 2017 has been, and we wish that much more money stands to be made in the new year. Having been very active in 2017 ourselves, we only hope that any S&P activity and asset appreciation is based on fundamentals and not on speculation, and any signs of concern mentioned above remain just that! Posted on November 11, 2016 by Karatzas Marine Advisors & Co.
How do you keep bananas fresh as they cross the oceans?